This result is really not so surprising. What it says is that, for example, if one asset has twice as much systematic risk as another asset, its risk premium will simply be twice as large. Because all of the assets in the market must have the same reward-to-risk ratio, they all must plot on the same line. This argument is illustrated in Figure 13.3. 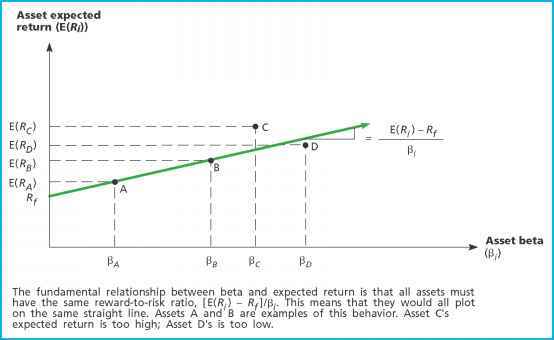 As shown, Assets A and B plot directly on the line and thus have the same reward-to-risk ratio. 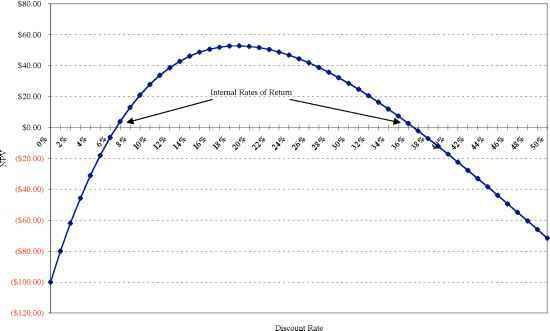 If an asset plotted above the line, such as C in Figure 13.3, its price would rise and its expected return would fall until it plotted exactly on the line. Similarly, if an asset plotted below the line, such as D in Figure 13.3, its expected return would rise until it too plotted directly on the line. The arguments we have presented apply to active, competitive, well-functioning markets. The financial markets, such as the NYSE, best meet these criteria. Other markets, such as real asset markets, may or may not. For this reason, these concepts are most useful in examining financial markets. We will thus focus on such markets here. However, as we discuss in a later section, the information about risk and return gleaned from financial markets is crucial in evaluating the investments that a corporation makes in real assets.